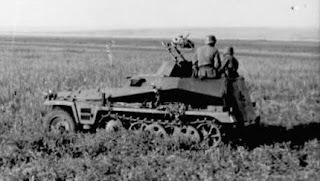 SdKfz 250/8 leichter Schützenpanzerwagen (7.5cm) "Stummel"
SdKfz 250/9 leichter Schützenpanzerwagen (2cm) "Caesar"
Notes: These rules are for the German SdKfz 250 half-track and its various models. Be sure to pick up the core Battleground WWII rules so you can get the most outta the rules below. Date Introduced: The Alte hull model (Mid '41) and the Neu hull model (Mid '44). The 250/1 (Mid '41), 250/1(sMG) (Mid '41), 250/2 (Mid '41), 250/3 (Mid '43), 250/4 (AAMG) (Mid '41), 250/4 (FO) (Early '43), 250/5 (FO) (Mid '41), 250/5 (Recon) (Mid '44), 250/6 Ausf A (Mid '41), 250/6 Ausf B (Late '41), 250/7 (Mortar) (Mid '41), 250/7 (Ammo) (Mid '41), Stummel (Early '43), 250/9 (Mid '43), 250/10 (Mid '41), 250/11 (Mid '41), 250/12 (Mid '41), 250/13 (Mid '43), 250/14 (Mid '41), 250/15 (Mid '41), 250/16 (Early '43) & 250/17 (Early '43). Vehicle Chart: Since the SdKfz 251 and 250 are pretty much the same, we use the 251's vehicle chart from the core rules set and just modify where needed. Crew: Because of the various models and their use, the crew complement will be described below under the appropriate model's special rules. 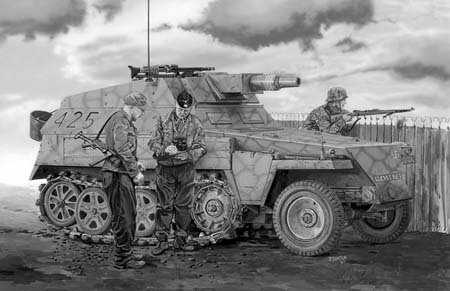 Commander As Loader: The commander served as loader for the main gun of the SdKfz 250/8 & 250/10 models. The commander may not direct fire on an action where they load the main gun, but may direct fire in a subsequent action to avoid the No Commander penalty. Winterketten or Ostketten Tracks: Any model from mid '42 on may be fitted with the Winterketten track grousers for use in ice and snowy fronts or from early '44 on with the Ostketten track for muddy battlefields. 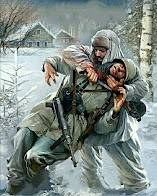 The Winterketten will provide a -1 to all Bog Checks made in snow or icy terrain and the Ostketten will provide a -1 to all Bog Checks in muddy terrain. Both tracks types will also negate any High Ground Pressure penalties. Availability for each is a 4 or less for any front. 1/2 Tracks: All the models of the 250 are bound by the 1/2 track rules within the core rulebook. Hull Machine Gun: Most 250 models will be fitted with a forward mounted LMG with gun shield manned by an exposed crew member or passenger. The weapon has an 180-degree field of fire to the vehicle's front with a 1" shadow. The gunner will receive the Gun Shield modifier from any fire coming from the front of the vehicle. The weapon can be dismounted as per the normal rules for doing so. Anti-Aircraft Machine Gun: If available, most models were capable of mounting a rear-mounted LMG on an anti-aircraft pintel mount. This weapon was manned by an exposed crew member or passenger and had a 180-degree field of fire to the rear of the vehicle with no shadow. Availability for an AAMG on most model is 5 or less but double check the vehicle characteristics chart below to be sure. 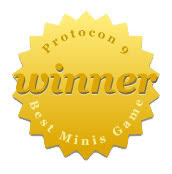 The weapon can be dismounted as per the normal rules for doing so. Open-Topped: All models are Open-Topped and will be bound by those rules as such. Alte & Neu versions: Although the Alte model is slightly heavier, both models have no major differences to modify their characteristics. Any 250 can be of either the Alte or Neu model without any additional rules. IR Upgradable: All models of the 250 are capable of being fitted with the Sperber "Falcon" IR System as described in the IR Rules. 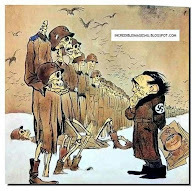 Availability is an 8 on the Eastern Front and a 5 on any other front. 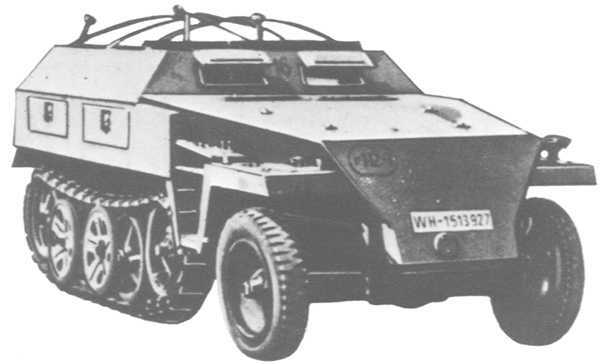 SdKfz 250/1: This model is the troop carrying model and is capable of carrying up to 4 passengers in addition to its normal 2 man crew (driver & radio op.). 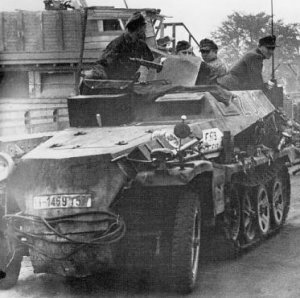 SdKfz 250/1 (sMG): This model of the 250 has a crew of 2 (driver & radio op.) along with a 4-man heavy machine gun section. The vehicle also carries with it, either two MG34s or MG42s on Lafette 42 tripods used for sustained fire. 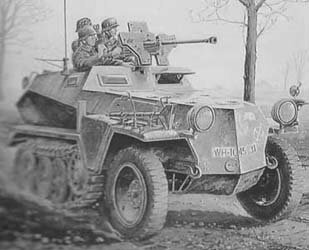 The vehicle's machine gun shield has been removed so that the weapon can be fired on the tripod in its heavy machine gun roll while still mounted within the vehicle. The gun crew can dismount one of the weapons and its tripod as normal while the other maintains its heavy fire. Note that the rules for the Lafette 42 and the MG34 and MG42 as a MMG will be used when mounted or dismounted from this vehicle. 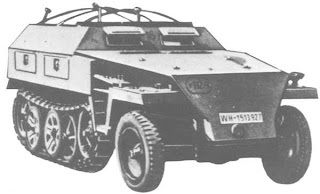 SdKfz 250/2: This model has a crew of 4 (driver, radio op. and two linesmen). This vehicle has special wire-laying equipment which allows it to lay phone wire for communication networks. 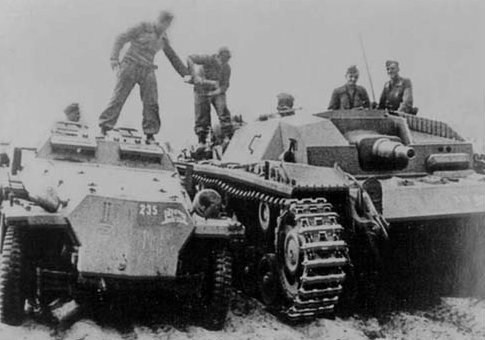 SdKfz 250/3 & 250/5: Both these vehicles have a crew of 4 (driver, commander & 2 radio ops.) and can carry an additional 2 passengers. These models are fitted with extra radio equipment and antennas and used as command and communications vehicles. Both models use both rod and frame antennas for the radios it carries. SdKfz 250 w/Solothurn LS-100: Some of these models were upgraded with a Solothurn LS-100 20mm anti-tank gun. This was obviously a field modification of not done on any large scale so the Availability is a 3 or less for this upgrade. 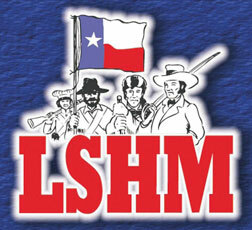 If fitted with the LS-100, the vehicle was provided with a gun shield providing the crew +5 Gun Shield cover. The LS-100s stats are below. The weapon has a 180-degree field to fire to the vehicle's front. 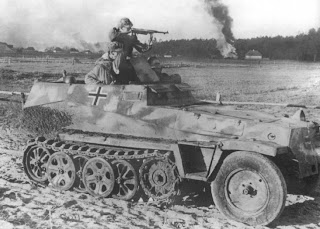 SdKfz 250/4 & 250/12: This model has a crew of 4 or 5 (driver, forward observer & 2 radio ops sometimes a rangefinder.) and is fitted with additional sighting and radio equipment and used as a mobile FO vehicle. The vehicle uses both rod and frame antennas for its radio equipment. All normal rules for a forward observer are as normal with the exception that they are a member of the vehicle's crew in addition to being a FO. 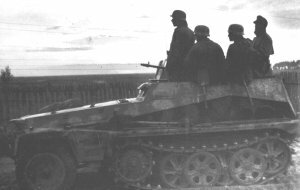 SdKfz 250/4: This is another version of the 250/4 which has a crew of 4 (commander/gunner, driver & radio op.) and is fitted with duel LMGs mounted on an 360-degree anti-aircraft mount with a 2" shadow. The mount has the same elevation as any other AA mount and will fire both guns simultaneously. 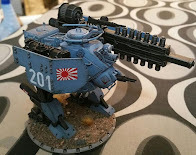 Technically this model was never produced but this is weird war so have at it! 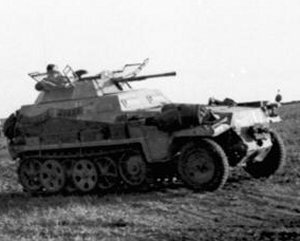 SdKfz 250/6 A & B & 250/7: Both these models have a crew of 2 (driver & radio). 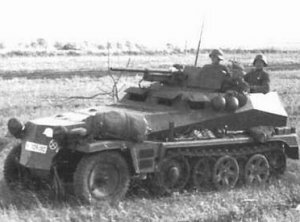 Both vehicles are modified to act as ammunition carriers so this vehicle can be attached to any SPG as its dedicated ammunition carrier. The 250/6 models are designed to carry main gun or howitzer ammunition where as the 250/7 is for mortar shells. Ammunition Carriers: Because of the amount of ammunition within the the above two models, they will suffer an additional -2 to the Vehicle Effects Chart if penetrated. 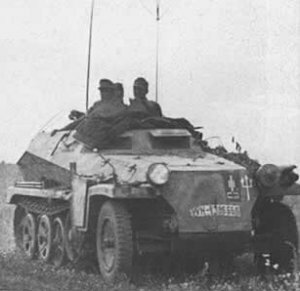 SdKfz 250/7: This model has a crew of 2 (driver & radio op.) and carries a 4-man mortar crew for the 81mm mortar it carries. The vehicle's gun shield has been removed so that the mortar can be fired from within the vehicle. The weapon fires as a normal mortar and can also be removed from the vehicle as per the normal rules for doing so. 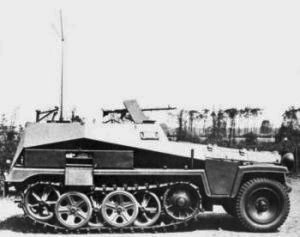 SdKfz 250/8 "Stumpy": This model has a crew of 4 (commander/loader, gunner, driver & radio op.) and is fitted with the 75mm KwK 37 L/34 cannon with gun shield and co-aux LMG. The hull mounted 75mm gun has a limited 24-degree arc of fire to the vehicle's front with a 2" shadow. Targets outside this arc will force the Stumpy to have to move to engage it. The vehicle's 75mm gun can fire AP, HE, HEAT, chemical smoke and canister shells. The crew will receive the Gun Shield modifier from any fire coming from the front of the vehicle. 75mm Kt.Kw.K. Canister Shell : This shell was in essence a large shotgun that fired 960 9mm steel balls in a devastating short ranged pattern. To fire the shell, just use the normal rules to fire the main gun and then place the 75mm Canister template 6" directly forward of the barrel and roll as normal for anything under the template. 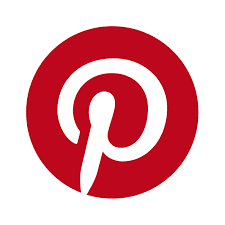 Anything within the path of the 6" before the template is placed is considered to be hit with an A column hit. Note that because the shell is in essence a shotgun shell, it can be used whilst on the move without the normal To Hit modifiers for moving whilst firing. The Availability is 10 with D8 shells available. 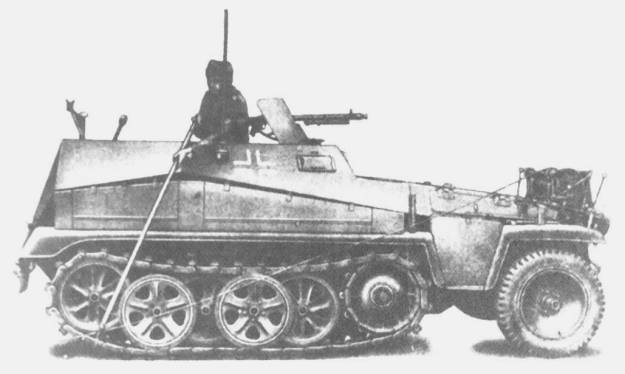 SdKfz 250/9: The Caesar model has a crew of 4 (commander/loader, gunner driver & radio op.) and is fitted with a 20mm auto-cannon with co-aux LMG in a semi-open 2-man turret. 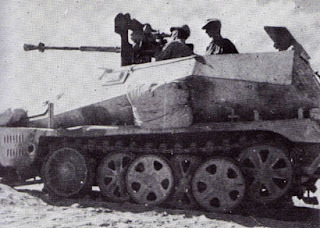 Later models were fitted with hanging that provided better AA defense which allowed the 20mm to be elevated almost 90-degrees with a 2" shadow. To use the weapon for AA defense or at targets in an elevated position, the grenade screens must be opened to do so. Opening the screen to use the weapon in this role is automatic but it will take an action to close them back up as normal. Hanging mounts were often retrograded to earlier models so it will have an Availability of 15 for any early models. 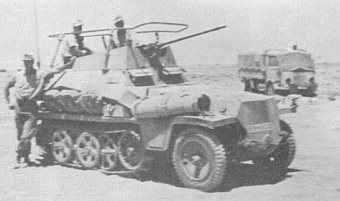 Open-Topped/Grenade Screen: The vehicle's turret is provided with metal screens that prevented enemy troops from throwing explosives into the vehicle. Any grenades or other explosives thrown into the the open hull or turret of the SdKfz 250/9 with the screens closed will cause it to bounce off the screen and fall to a random side of the vehicle on a 15 or less. On a 16-19, the explosive explodes just as it hits the screen and it will be treated as normal to any crew or passengers covered by the HE template. On a score of 20, the explosive falls into the vehicle and then explodes and will cause everyone within it a A hit as well as cause an automatic result on the vehicle effects chart. The deflection for the vehicle is a 19 with a 20 exploding as normal due to the larger screen that fully covers the opening in the vehicle's hull. If the screens are open then treat as a normal opening in a vehicle with all normal rules as such. Crew can still be exposed while the screen is closed and still benefit from its special rules as well as +5 cover to any incoming fire. SdKfz 250/10: This model has a crew of 4 (commander/loader, gunner, driver & radio op.) and is mounted with a PaK 35/36 with gun shield. The hull mounted 37mm gun has a limited 45-degree arc of fire to the vehicle's front with a 2" shadow. Targets outside this arc will force the vehicle to have to move to engage it. The vehicle's 37mm gun can fire AP and HE. The crew will receive the Gun Shield modifier from any fire coming from the front of the vehicle. 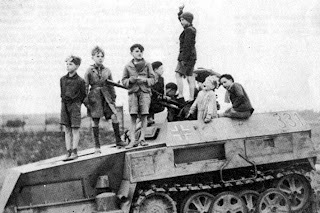 SdKfz 250/11: This model has a crew of 5 (commander, gunner, loader, driver & radio op.) and is mounted with the 28mm sPzB 41 with gun shield. The hull mounted 28mm gun has a limited 45-degree arc of fire to the vehicle's front with a 2" shadow. Targets outside this arc will force the vehicle to have to move to engage it. The vehicle's gun can fire AP and HE rounds. The crew will receive the Gun Shield modifier from any fire coming from the front of the vehicle. 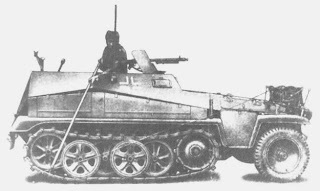 The vehicle also mounted the sPzB 41's carriage on the outside of the rear of the vehicle and thus can be dismounted and used like normal. It will take the gun crew a full action to dismount the weapon and mount and another to assemble it for ground use. Once dismounted, follow the regular rules for the sPzB 41. 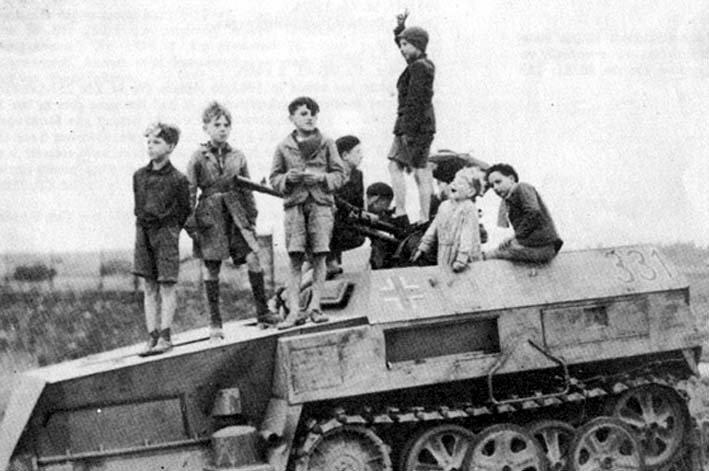 SdKfz 250/13: This model has a crew of 5 (commander, gunner, loader, driver & radio op.) and mounts a PaK 38 with gun shield. The hull mounted gun has a limited 24-degree arc of fire to the vehicle's front with a 2" shadow. Targets outside this arc will force the vehicle to have to move to engage it. The vehicle's gun can fire AP, APCR, HE and chemical smoke rounds. The crew will receive the Gun Shield modifier from any fire coming from the front of the vehicle. This is a very rare modification and will have an Availability of 5 or less. 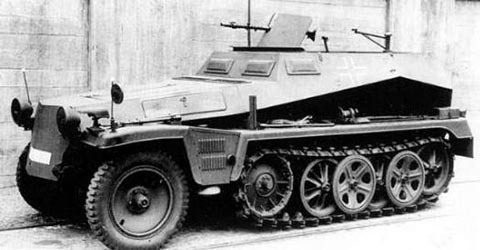 SdKfz 250/14: This model has a crew of 4 (commander/loader, gunner, driver & radio op.) and mounts the 25mm PaK 112(f) with gun shield. The hull mounted 25mm gun has a limited 45-degree arc of fire to the vehicle's front with 2" shadow. Targets outside this arc will force the vehicle to have to move to engage it. The vehicle's gun fires only AP rounds. The crew will receive the Gun Shield modifier from any fire coming from the front of the vehicle. This model of vehicle was only issued to German units in North Africa. 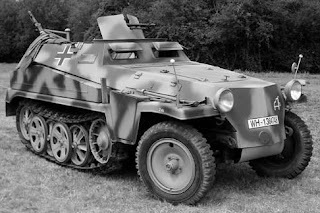 SdKfz 250/15: This model has a crew of 3 (commander/gunner, driver & radio op.) 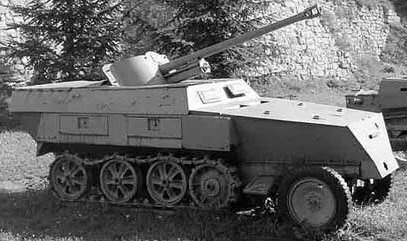 and is fitted with the Italian 20mm Breda Model 35 auto-cannon. The weapon has a 45-degree field of fire to the vehicles front with a 2" shadow. This model was rare and will only be Available on a 5 or less. SdKfz 250/16: This model has a crew of 4 (commander/gunner, loader, driver & radio op.) and mounts a 20mm flak gun. This mount allows the weapon to be elevated to where it could engage aerial targets. The weapon has a 360-degree field of fire when the troop compartment panels are lowered otherwise it only has a 45-degree field of fire to the vehicles front. Their is a 2" shadow all around the vehicle. It will take the crew a single action to lower and raise the panels. When lowered, all the gun crew are considered exposed. 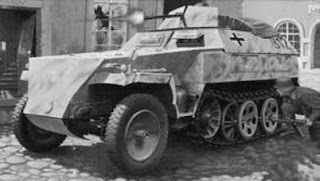 SdKfz 250/17: This model has a crew of 2 (driver & radio op.) and has had its rear armored troop compartment removed and replaced with a flat bed used for hauling supplies. Alternatively, up to 8 passengers may ride in the open bed. 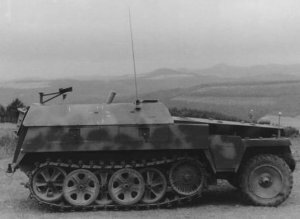 KwK 30 L/55 or KwK 38 L/55 Upgrade: It was not uncommon for SdKfz 250 crew to upgrade their LMG to a 20mm autocannon if available. The weapon has a 90-degree field of fire to the vehicle's front with all normal vehicle shadows in play. Availability is a 5 or less for this upgrade. Note that the gun shield was omitted to allow the weapon to fit within the troop compartment. The stats for the weapon is below. 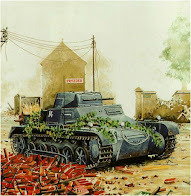 Wargaming Piece: I know Gaso.Line does several models of the SdKfz 250 so swing over to Quarter Kit and see what they got.